"September of 1922 was a defining year for the development of Modern Greece. 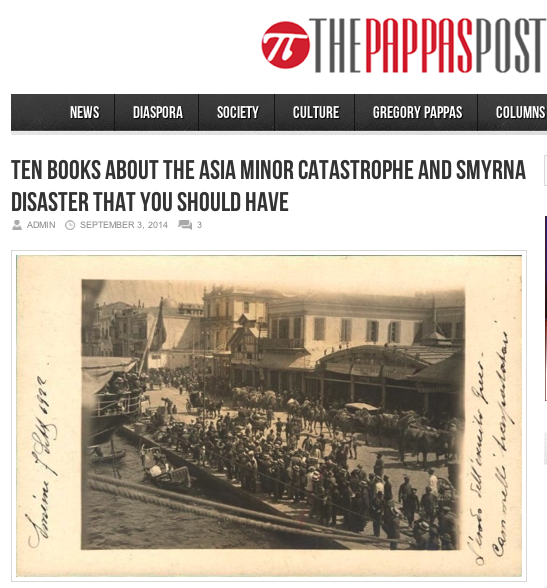 Known as the Asia Minor Catastrophe, tragic events marked the end of the Greek presence in Asia Minor– modern Turkey’s western shores. It was a presence that had been in existence for thousands of years and it all came to a tragic culmination on the docks of a once-cosmopolitan city known then as Smyrna, today as Izmir. Tens of thousands of Greeks lost their lives and millions fled to mainland Greece, a place and country they knew nothing of. We’ve selected the ten books that share these tragic stories, each from different perspectives, but all from academic and factual backgrounds. There are numerous books available, including harrowing and emotional survivor testimonies . . . "